Review Summary: "The Black Parade" is My Chemical Romance's magnum opus, epic and spectacular; it would be a mammoth accomplishment...if 90% of it hadn't been done before. Somehow, The Black Parade has escaped media attention leading up to its release. It’s quite surprising, considering the media darlings My Chemical Romance have become. Regardless, they did release the single “Welcome to the Black Parade” which took the half the world that cared by storm. Not in a positive way, mind you; people were utterly confounded by the supposed huge change in direction they had taken. Instead of being a mediocre pop punk act, they suddenly seemed to be ripping off Queen and the assorted arena rock bands, all the while throwing in horn sections that wouldn’t be unwelcome in a 3rd wave ska band. 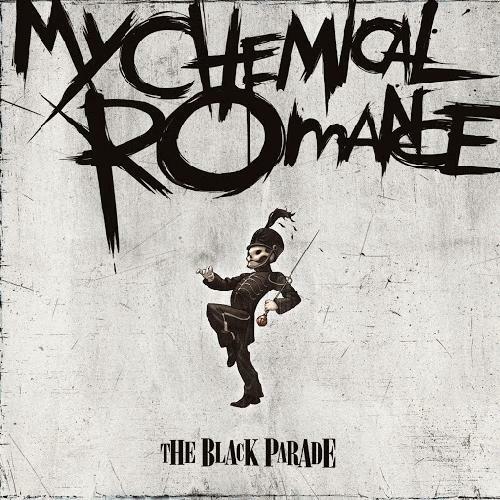 “Welcome to the Black Parade” is not that huge of a departure for the band, however, and neither is this album. Nearly every song has a distinct My Chemical Romance feel to it, yet also takes largely from rock acts like Journey and Styx. The most punctual way to describe the effect is it sounds like My Chemical Romance covering a bunch of late 70’s/early 80’s rock super-hits, and giving each a large dose of their own personality. Thus, the album feels far from original, but you can’t fault MCR for ripping off good bands this time around. Then again, when it comes across so blatantly, maybe you can. “Welcome to the Black Parade” feels like the biggest Queen rip-off ever; from the piano-driven intro (extremely reminiscent of “Bohemian Raphsody”), to the huge bombastic chorus leading into the main section of the song, to the guitar solo, its all so…calculatedly stolen. Another One Rips Off the Queen, maybe" Luckily, the elements that are still obviously My Chemical Romance are excellent; the guitar playing has improved dramatically, with the riffs not sounding uninspired anymore, the rhythm section laying down solid support for Gerard way’s voice to flail wildly about, and the strange unexpected utilization of horn sections being quite a treat, even if the marching drums are horribly cliché and useless. Power ballads are the order of the day, to varying degrees of effectiveness. “Disenchanted” sounds like a bastardized version of a Chicago ballad and a more mellow Glassjaw track. While it isn’t incredibly interesting, Gerard way’s vocals are enough to keep you tied into this song (as they are on most), and to say Way isn’t influenced by vocalists like Daryl Palumbo and even Claudio Sanchez would be quite a misstatement. “I Don’t Love You” is yet another unoriginal song, but more in the vein of a 90’s alternative cut, if you watched VH1 in ‘97, you’ve heard this song before. There are more missteps the album takes, such as the terribly simple and ineffectual “The Sharpest Lives” (which also happens to be the song most similar to something you’d find on their first album), but for the most part, The Black Parade manages to be entirely exciting. The beginning of the album kicks off with a powerful one two punch in “The End” and “Dead!”. The first is a venomous acoustic song, with Gerard singing (with no small amount of sarcasm) about his death (or rather about the death of the main character of the concept- yes, The Black Parade is a concept album). It sets up well for “Dead!”, which is similarly jaded and pointed, but instead of being a simple acoustic track, it’s a balls to the wall hard rock song, complete with a fret-masturbating solo and a chorus of “la la la’s” that make for one of the strangest moments on the album. “House of Wolves” features Gerard at his best, as he goes all over the register and even starts doing a rockabilly type of delivery as he spits the line “You Better Walk Like the Devil/’Cause They’re Never Gonna Leave You”. While it sounds more than a bit like the Stray Cats “Stray Cat Strut” (thanks, babe), its yet another example of MCR tastefully stealing from an older act and making it work…in a twisted, warped way. “Cancer” does much the same, but instead of working, fails miserably. The lyrics about cancer, while in theory quite touching and well written, come off as pretentious and cliché, as he whines on and on about obvious facets of cancer, and in the most over-dramatic fashion possible. As an album, The Black Parade is far superior to either of the bands previous efforts. It sounds cohesive, the narrative while cliché is still strong, focused, and well thought out, and the band members themselves have improved, especially the guitarists. Gerard has also come along far in his singing ability; while the jump isn’t as big as it was from I Brought You… to Three Cheers, it’s still noticeable and appreciated. Then, you start thinking about it a little bit more…and realize how much was really wasted here. Gerard went power crazy and essentially took control of the music entirely, no song on here sounds particularly original (and with a bit of light research, you could find classic singles that precisely resemble almost any song off of here), and no songs reach the heights “Helena,”, “Our Lady of Sorrows”, or “thank You For the Venom” did. Thus, you have to take The Black Parade as it is. It’s a lighthearted and catchy romp through rather serious issues such as euthanasia, a pop punk album littered with metal and arena-rock instrumentation, and a large sense of nostalgia for the good ‘ol days of rock and roll. It fails as a rock opera, as it never reaches the heights of any of its predecessors, but it doesn’t fail as badly as an album as Kilroy Was Here or Tommy do. It’s a solid piece of branching out that while avoiding tiredness, still brings on a far too present smell of familiarity that ultimately drags the album down. Glassjaw Everything You Ever Wanted to Know About Silence. these guys wont be around or remebered for being great in the next 10 years. The single is horrible, and the video is worse. The song is good, the album however very lacks. The review about sums up my opinion. “Welcome to the Black Parade” is not that huge of a departure for the band, however, and neither is this album. Nearly every song has a distinct My Chemical Romance feel to it, yet also takes largely from rock acts like Journey and Styx. I agree with this, but I wouldn't say it largely borrows from them, largely in some songs, very minimally in others. I personally think the single is pretty good, This Is How I Disappear has its moments, so does Mama, and I love the first 30 seconds of Famous Last Words. Why don't these guys just put a smile on their dial? No one likes a sook. And what of Cancer? The self-proclaimed "darkest song ever written"? Bit of a dud! Their lead singer boasts of Cancer being the darkest song ever and it fails to deliver in the biggest way since the follow-up to Psycho. Great review. The single is at times catchy. Yes Im not the only one who thinks Welcom to the black parade sounds like a Queen rip off, or sounds like a Queen song! Great review. I'm buying the album today, so I'll be able to give a review soon enough. BTW, was Cancer REALLY that much of a let down? Everyone is going to hate this because it's cool to hate this. It's also cool to hate music the critics have been raving thus far (surprisingly). So it wouldn't surprise me to see this dip below the 3 mark even though it is overall a fairly solid album that pleasantly surprised me. I can't tell if this is better or worse than the rest of MCR's discography. There are some pretty great songs on it, like House of Wolves and Sleep. Also, the concept and the stuff about this CD being made by their "alter egos" is retarded. Your review wasn't too bad, I kind of expected better tbh. I dont get what the big deal is that their music sounds influenced by other bands. I mean every band has their influences but they dont get slammed for it. He's saying it sounds EXACTLY LIKE other bands, not that it's just highly influenced. There's a big difference.